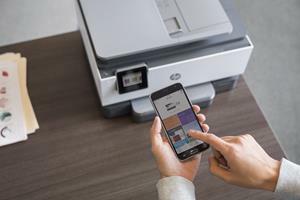 PALO ALTO, Calif., March 12, 2019 (GLOBE NEWSWIRE) -- In the lead up to HP Reinvent, HP's largest global partner event, HP Inc. unveiled a new line of smart printers specifically designed for small businesses. The new HP OfficeJet Pro series brings dramatically increased intelligence and breakthrough design with HP's heritage of performance and reliability. It provides small business owners with a critical tool to achieve success. "HP designed this series specifically for the small business owner who can't possibly work harder, though the pressure to do so is constant given how closely their finances, livelihood and emotional well-being are tied to their business," said Anneliese Olson, Global Head and General Manager of HP's Home Printing Solutions. "With more than half of small business owners agreeing that their businesses cannot operate without a printer3 – we elevated this technology to perform more like a partner to help save time and ‘brain space' so these entrepreneurs can focus on growing their business." HP began the reimagination of the HP OfficeJet Pro series, the best-selling business inkjet printer in the US4, more than three years ago. The company connected with thousands of small business owners in more than 20 countries, identifying areas where HP innovation and creativity could help each achieve their goals. These global conversations led to the reinvented HP OfficeJet Pro series launching today. Smart. Mobile. Secure.5 And up to 39% smaller than previous versions2. "Every minute I'm not customer-facing hurts my business. When I'm in the back doing admin it directly impacts our performance – an absent owner is never successful," said Aaron Cook, founder of Three Seat Espresso, a small business in New York City. "I'm always looking for ways to cut down my admin so I can focus on building my business. 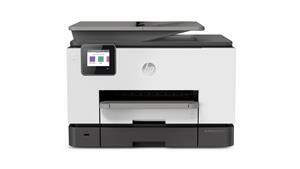 The new HP OfficeJet Pro series is saving me a lot of time, and ensures I spend more time with my customers every day." Eliminate steps in repetitive tasks with Smart Tasks, the first in-class mobile solution that automates scanning tasks6. Organize documents 50% faster7 and get automatic two-sided printing and advanced scanning; scan to the cloud, email, and more, in just a tap and even create editable, searchable documents scanning from your phone or printer6. Stay connected to business and get work done wherever, whenever. Easily print, scan and copy from your phone, using the best-in-class mobile print app: HP Smart8. No need to shop for cartridges as the new printer automatically orders ink when you're running low10. Instant Ink Business plan (700 page/month), provides small businesses with high-volume print usage an affordable way to print. Get two years of hassle-free printing with ink delivery, included with the Premier model11. Get best-in-class security1 to help maintain privacy and control, and self-healing Wi-Fi that always keeps you connected12. The new hardware is designed to help reduce energy use, paper is responsibly sourced and ink cartridges are easily recycled13. The 8000 series is made from recycled printers and other electronics—more than 15% by weight of plastic. 9000 series with more than 10%. The new smart output tray management prevents paper spillage when the 250-sheet output tray is full (only 9025 series). 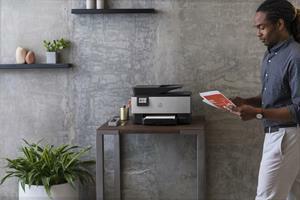 For additional information on HP OfficeJet Pro series, see here. Images and datasheets available here. Starting this month in the US at key office and electronic retailers – as well as HP.com – the HP OfficeJet Pro Series (9015, 9025 and Premier) will be available for small business printing. HP OfficeJet Pro Series (8025, 8035) will be available in June. 2Up to 39% smaller: Smaller footprint compared only to dimensions of HP OfficeJet Pro 8720 and HP internal research of published specifications. Footprint for the HP OfficeJet Pro 9020 is 17.2 x 15.6 x 12.5 inches (436.88 x 396.24 x 317.5 mm); for the HP OfficeJet Pro 8720 it is 19.7 x 20.9 x 13.4 inches (500.38 x 530.86 x 340.36 mm). 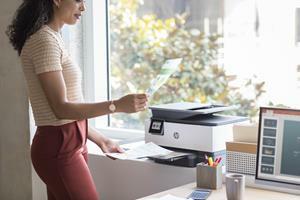 3More than half of small business owners agreeing that their businesses cannot operate without a printer: The HP Small Business Today Survey is a global study by HP Inc. It was conducted by global market research firm Edelman Intelligence, across four continents and 10 geographical areas (USA, Canada, China, Germany, Mexico, Russia, Iberia (Spain and Portugal), South East Asia (Indonesia, Thailand, Vietnam, and Philippines), UK, and India). Fieldwork took place over February 2019. We interviewed over 4,300 small business owners (1-100 employees) aged 18+. 4HP OfficeJet Pro series: Best-selling business inkjet printer in the United States: Includes HP OfficeJet Pro 8740, 8730, 8720, 8710, 7740, 7720, 6968 & 6960 as of March 5, 2019 compared to the majority of competing in-class ink cartridge business color desktop inkjet all-in-ones sold in the United States <$399 USD based on unit sales and market share of IDC 2018 Hardcopy Peripherals Tracker, 2018Q4 release. 6First in-class mobile solution that automates scanning tasks: Compared to the majority of competing in-class consumer color desktop inkjet all-in-ones <$299 USD. Keypoint Intelligence - Buyers Lab 2018 research study commissioned by HP based on research survey of printer manufacturers' published specifications, sustainability reports and press releases as of 12/15/2018 and not confirmed by lab testing. Market share as reported by IDC CYQ3 2018 Hardcopy Peripherals Tracker, CYQ3 2018 Release. The ability to automate work defined as having the capability to use the OEM mobile print app to create a multistep workflow on mobile device and have a shortcut appear on both the app and on control panel of printer; and/or use intelligent Optical Character Recognition to name a scanned file based on the first few words of a document. For more details, see http://www.keypointintelligence.com/HPOfficeJetPro.